SUBHEAD: 60 Day Legal Notice to Enforce the U.S. Endangered Species Act on the U.S. Navy and RIMPAC. 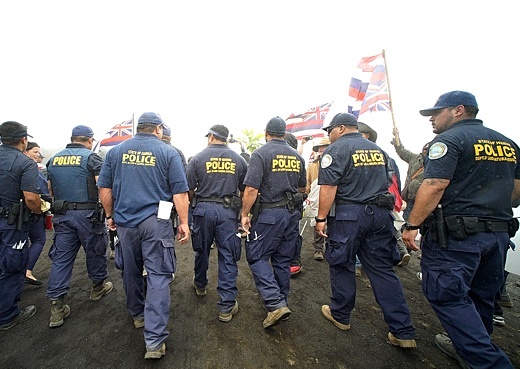 Image above: DLNR police armed with semiautomatic weapons enforcing restrictions on Hawaiian protest of construction of Thirty Meter Telescope on a sacred part of the summit of Mauna Kea mountain on the Big Island in 2015. From (http://www.civilbeat.org/2015/12/should-hawaiis-dlnr-cops-carry-semi-automatic-weapons/). As Chair Person of the Hawaii DLNR you are head of law enforcement and bound by law to enforce the US Endangered Species Act (ESA) here in Hawaii. When you took your oath of office you swore to uphold US and State Law. The federal and state ESA claims " Any employee or agent of the department upon whom the board has conferred powers of police officers, including the power to serve and execute warrants and arrest offenders, or issue citations throughout the state, and any police officer of the counties of this state shall have the authority to enforce any of the provisions of this chapter or any rule adopted under this chapter". Furthermore, it has been determined in court "That the Willful Omission of enforcing the ESA can be considered a Take under the law itself". Which means that you are obligated to enforce this law. I know you are well aware of the wording in the ESA and are aware of the need for the Navy to do a Habitat Conservation Plan before operating in the habitat of Hawaiian endangered species. The reason I know you know this law is because in December of 1998 you attended and graduated from the same class I did in California which was hosted by the US Fish and Wildlife Service and Craig Potter who wrote the ESA in 1973. The class was called "Endangered Species Act and Habitat Conservation Planning". You are listed on the attendance sheet as "Suzanne Case : The Nature Conservancy: 201 Mission Street 4th FL San Francisco CA : 415-281-0466. During that class we were both give many legal quotes out of the ESA itself and also many court case studies. We were presented by the top environmental attorney firms in the USA and Craig Potter himself these quotes about the ESA. 1. ESA Section 7 requires that EVERY Federal agency consult with the Fish and Wildlife Service (FWS) to ensure that the agency actions are "not likely to jeopardize the continued existence or ANY endangered species or result in the destruction or adverse modification of designated critical habitat of such species. I can prove that the war ships off our coastline during RIMPAC and the US Navy five year long electronic microwave war testing here in Hawaii is "likely" to jeopardize the critical habitat of the endangered green sea turtle, hawksbill turtle and monk seal. These ships put out billions off watts of electromagnetic energy they discharge into the sea and they are using high intensity sonar. Both of these events harm, harass and take our endangered species. 2. 16 U.S.C. 1536 (a)(3)(4), 50 C.F.R. 402.14 legal code claims that : If the agency determines that an endangered species MAY be present in the area affected by the action and proposed actions is LIKELY to effect the species the ESA REQUIRES consultation. NOAA has already determined that all Hawaiian waters are critical habitat for the monk seal because these endangered species travel in between islands! Plus the very rare hawksbill turtle travels between islands and the baby green sea turtles live out at sea for the first part of their life. So it is obvious that the wide area of sea that the Navy is discharging electricity into, blasting with explosives, sinking ships with bombs and using massive amounts of sonar and underwater (DARPA) tested electronics to track and destroy submarines is "likely" to harm, harass and take our endangered species. 3. Section 7 V. Section 10 of the ESA is a process by which FEDERAL agencies obtain permission to "TAKE" endangered species. The Navy must file for and receive an Incidental Take Permit to START RIMPAC or their microwave war test. Section 7 outlines the process that the Navy must take to get a permit to operate in the habitat of our endangered turtles, whales and monk seas. This process is called an HCP. Habitat Conservation Plan as a plan describing the ANTICIPATED effect of proposed taking on the affected species and HOW that TAKE will be minimized and mitigated for : the plan is submitted with and Incidental Take Permit. No HCP was done or submitted by the Navy to operate RIMPAC! RIMPAC is in direct violation of the most powerful environmental law ever adopted by a country on our planet. Commander Bruce Hay from PMRF openly told all of us on the KKCR radio show and in a private meeting with the top PMRF officials "RIMPAC 2014 had no way to monitor the effects on the sea turtles and coral reefs". He further said "RIMPAC 2016 will be operated just like RIMPAC 2014 and the Navy has NOT done an environmental study ahead of time or a Habitat Conservation Plan". The ESA has been held up in court against the US Navy in dozens of law suits filed by the NRDC and Earth Justice and once again it looks like we must got to court to force the Navy to follow our Endangered Species Act, Marine Mammal Protection Act and Clean Water Act. As a citizen of the USA I have the LEGAL rite to make you enforce the ESA onto the Navy. I have the legal rite to sue the Navy, NOAA, and the DLNR for violating the ESA and, or lack of enforcement of the ESA. This is called a Citizens Suit. It is described in the ESA section 11 as : To enjoin any person, INCLUDING the United States of America and other governmental instrumentality or agencies, who allege to be in violation of the ACT or its implementing regulations. Craig Potter who wrote the ESA said " This is the peoples law" because the people own the wildlife, not the government. Well I am "the people" and I wish to formally allege that the US Navy is currently in violation of the ESA for not doing the needed Habitat Conservation Plan before RIMPAC started. I allege that you are violating the ESA for lack of enforcing the ESA onto the military. I allege that very same actions on NOAA for their lack of enforcing the ESA onto the military. I am alleging these violation on behalf of the endangered sea turtles, whales, monk seals and their coral reef habitat because I have direct proof via HD video with time, date and GPS of the US Navy and their guests during the 2014 RIMPAC harming, harassing and taking our endangered species. Since Commander Bruce Hay said "that RIMPAC 2016 will operated like RIMPAC 2014" and we know the capabilities of the ships currently involved in RIMPAC today we easily have the "Likelihood" that these current operations are effecting the habitat of our endangered species. Therefore by law the military needs to stop ALL activities in Hawaiian waters and do the needed Habitat Conservation Plan and acquire the needed Incidental Take Permit to resume their destructive activities! Please look at this letter as a legal 60 day notice under the ESA to force you to enforce the ESA on the US Navy. This is the responsibility of the oath of office you hold. I would be more than happy to meet with you and your legal council in person and go over all of the documented proof I have of the violations of the ESA the Navy has committed. I already had a high profile meeting with the Navy brass in Kauai of which they did NOT dis agree with any of these violations!